In January–February 2018, a development excavation was conducted at the ancient village of ʽEn Gedi (License No. B-458/2018; map ref. 237470–525/596600–700) to prepare the site for inclusion into the nearby national park. 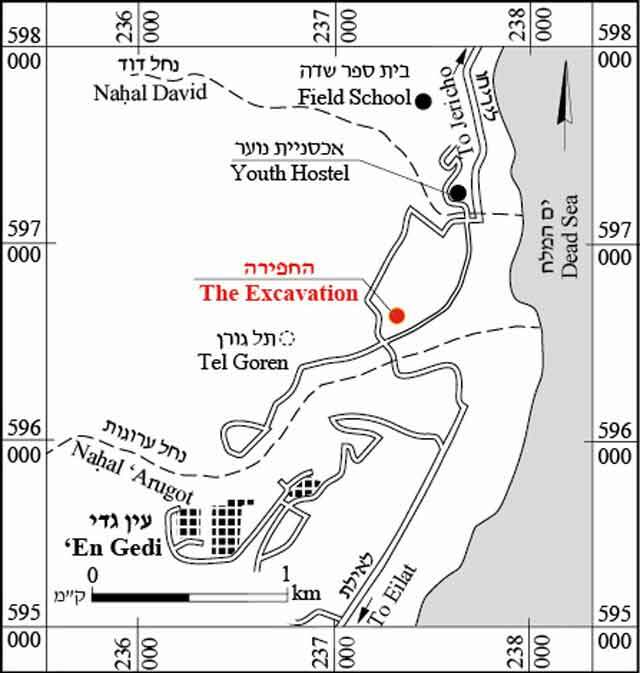 The excavation, on behalf of the Hebrew University of Jerusalem’s Institute of Archaeology and in cooperation with the Israel Nature and Parks Authority, and Dead Sea & Arava Science Center, was directed by G. Hadas and O. Peleg-Barkat, with the assistance of R. Merhav (administration), D. Porotsky (plans), A. de Vincenz (pottery) and M. Lavi (laboratory). Volunteers from Israel and abroad, mostly veterans of the ʽEn Gedi expedition, participated in the excavation joined by instructors from the ʽEn Gedi Field School and students of the Melah Ha-Arez preparatory program at ʽEn Gedi. 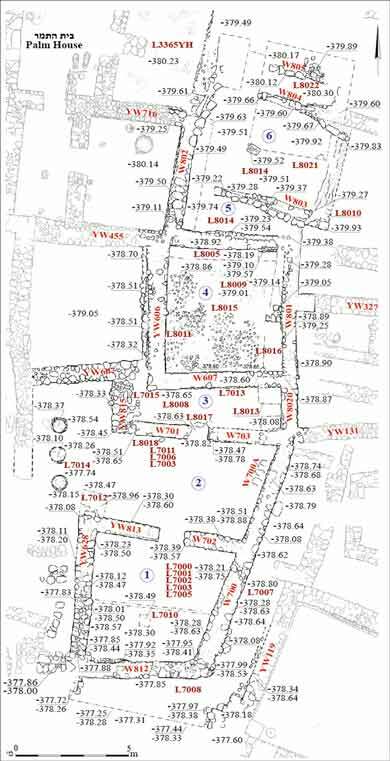 The purpose of the excavation was to continue to connect the two parts of the Byzantine village excavated by Y. Hirschfeld (2007), in an area that he left unexcavated because a large water pipe that ran through the site from north to south had prevented a single, continuous excavation. In the current season, work was resumed in the center of the unexcavated strip, to the north of the area dug in the previous season (Figs. 1, 2; Hadas and Peleg-Barkat 2017). As in the past, the current season yielded evidence of clearance work undertaken with a tractor in the 1950s that severely damaged the remains of buildings from the Mamluk period. This time, however, a Mamluk floor was uncovered, abutting a wall preserved to the height of the bottom course. The Mamluk building was built into the remains of a room from the Byzantine period. As elsewhere at the site, the walls of the Byzantine buildings were built of fieldstones and mud as well as sun-dried mud-bricks. One or two courses of the walls were preserved close to the level of the floors, and no openings could therefore be identified. Consequently, the rooms are numbered in ascending order from south to north. Room 1, the southern room (L7010 in the previous season), resembles a right-angled trapezoid in plan (5.0 × 5.5 m) and has a floor consisting of several layers of fine yellowish clay. Room 2 is irregular in plan. Its western part, excavated by Hirschfeld, yielded three Byzantine-period ovens. Its eastern part was unearthed in the previous season (L7011). The current excavation cleared the top part of the middle and southern ovens (the northern oven was unearthed by Hirschfeld) and uncovered the remains of a Mamluk-period oven that lay above them. Multiple ash layers from the ovens indicated that the site was an industrial and not a residential one, although no remains attesting to its function were uncovered. Room 3 (L7013) was partially unearthed in the previous season. It became evident that this was a narrow, rectangular room (2.3 × 6.5 m) with an opening leading southward, into Room 2. It had a fine clay floor containing Byzantine-period potsherds, mainly pithoi fragments. Room 4 is quadrangular in plan (L8015; 4.5 × 5.5 m) and its floor comprises two layers: a layer of fine, beige clay (thickness c. 0.2 m) laid on a bedding of pebbles. The upper layer retains crisscross tread marks of a tractor; it nevertheless yielded a few scattered coins and Byzantine-period potsherds, including an intact candlestick. 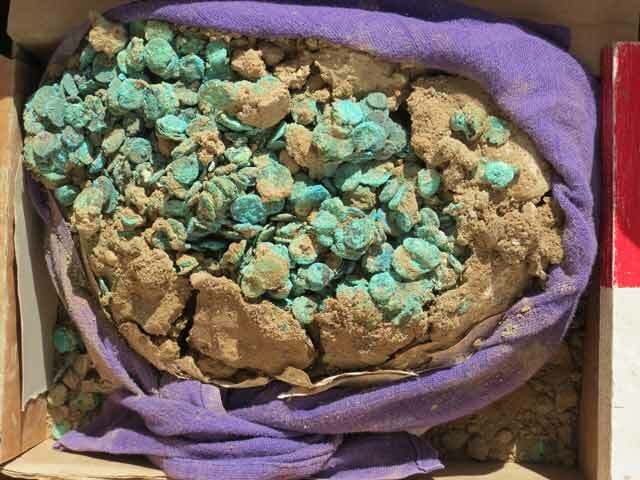 Beneath the pebble bedding, a hoard of roughly one hundred small bronze coins was discovered. The coins were held in a cloth sack, of which only very small fragments were preserved (Fig. 3). Room 5 (L8014) was built over a room from the Byzantine period; it was only partially unearthed. Its walls were preserved to the height of one course. A Samara Formation ashlar uncovered in the center of the room was engraved with numerous hollows forming a Mancala playing board. The room opens to the west, to a room belonging to the ‘Palm Tree House’ excavated by Hirschfeld (L3365; Hirschfeld 2007:55). The opening is blocked by the later, Mamluk-period building (Room 6). Room 6 (L8021), built in the Mamluk period, retained a single course of its southern wall (W803) and a floor of greenish clay that was damaged by plowing. Scant remains of the western wall were found above a Byzantine wall (W802), and even fewer remains were discovered in the east and north, all of which will be examined further in the coming season. The area excavated in the current season was similar to that uncovered in the previous season. The meager remains from the Byzantine period include walls preserved to the height of one or two courses and floors that were found right below the surface. For the first time, however, traces of a building from the Mamluk period were uncovered. The current season recovered few finds, except for the hoard of coins found beneath the floor in Room 4, which raises questions regarding the circumstances of its concealment. The next season will extend the excavation northward, exposing the top of the walls that join the two parts of the village excavated by Hirschfeld. Hadas G. and Peleg-Barkat O. 2017. ʽEn Gedi HA-ESI 129. 3. Hoard of Byzantine coins discovered in Room 4.